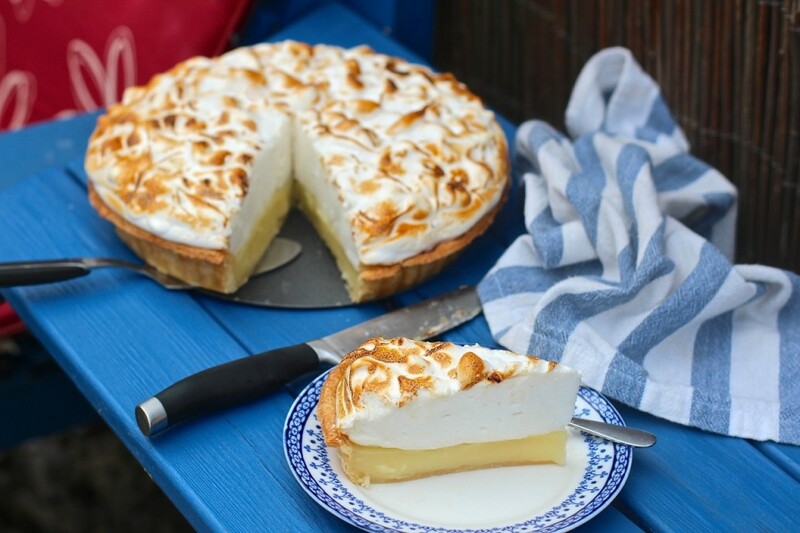 This meringue is like the real deal! Just look at the cell structure! Unless you eat it, which ofcourse, you will, as it’s so jolly good! It’s just like the real thing, so no more sloppy foam inside that doesn’t set! The pastry is to die for! It’s well worth taking the time to make it yourself, as it’s so much nicer than using a shop bought, ready made pastry case. It’s flaky and just perfect and wafer thin! 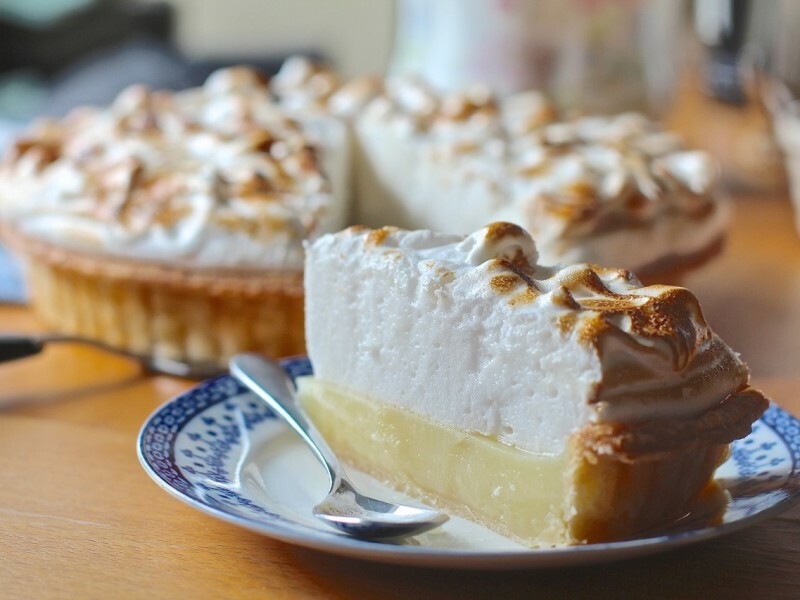 The Lemon Curd sets nicely, is nice and lemony and a great contrast to the sweet,light and airy mounds of billowy Meringue. This is diet disaster territory! Seriously, if you’re trying to be good, I apologise, because I am leading you astray, but it is well worth falling off the bandwagon for! 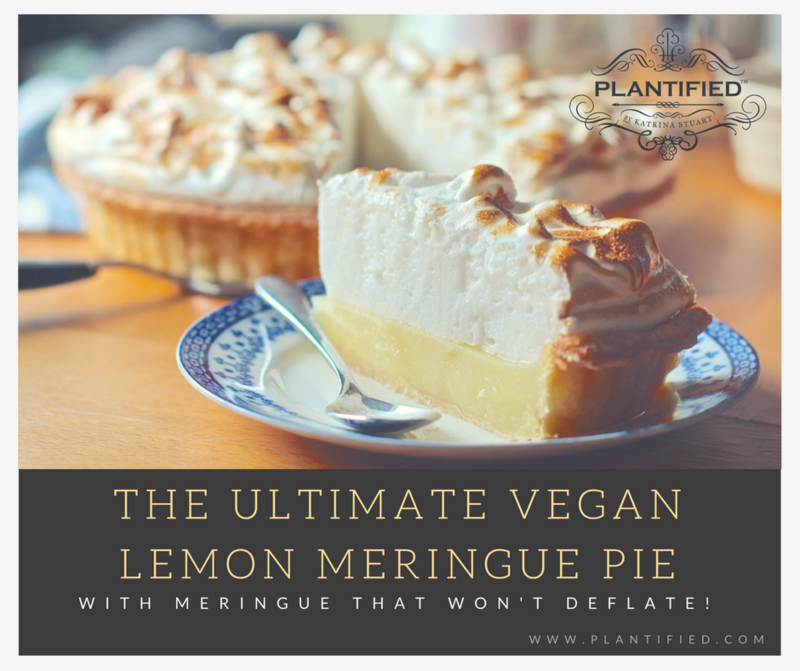 I have come a long way from the first vegan Lemon meringue Pie I ever made! The first one was whipped up in the dark of night, a year ago, after hearing about Aqua faba on the internet! I didn’t believe it could possibly be true, so I just had to try it! Since then, as you can see by the food I have produced, i have made many different things with it from mousses of all kinds, through to Rocky Road, Pies and Cheese Cakes! But it still irked me that the meringue in the Lemon Meringue Pies made with Aqua Faba just still were not quite the same as ones made with Egg, which set, rather than stay foamy inside, and one of the Plantified Members asked me if I could make her a recipe that was like the ones she used to enjoy, so I got out my chefs hat and whipped one up, and Voila- here it is! I hope you really enjoy it! Please share with your friends and if you do make one with the Plantified recipe, please post it on Facebook with #Plantified so we can all see your creation! My Plantified Mousses Recipe book is on it’s way to being finished, and you will receive an email letting you know when your FREE copy of the E-book is ready to download! If you would like a FREE COPY OF THE RECIPE E-BOOK, and haven’t yet signed up to Plantified, please sign up here: http://plantified.com/register/ and you will receive your FREE recipe book once it is released. Mango and Passionfruit Mousse Joconde Entremet, as seen in the Free Mousse E-book for members of Plantified. *** Like everything , accuracy in measuring and weighing yields the best results. The sugar syrup requires a candy thermometre to check the temp. If you don’t have one, use the Ice cold water trick, and drop some syrup into the cold water. The syrup should form a firm, stable ball that loses its shape once pressed. ***The pastry and lemon curd need to made the day BEFORE topping with the meringue, to give the curd time to set firm!!! ***Don’t know where to buy Agar Agar powder cheaply? Put the self raising flour in a mixing bowl. If you don’t have self raising flour, just add 1.5 tsp (8g) to 150g of plain flour of baking powder. Mix it into the other dry ingredients and add the margarines. With a knife (or I use a pastry blender as it’s much quicker) cut the margarines into the flour mix. Don’t cut the margarine too much (ie. don’t bread-crumb it). It needs to be rough and reasonably chunky. Mix the vinegar and soya milk until it splits (this only takes a few seconds). Slowly add the curdled soya milk into the pastry and cut it in with a knife. It’s very important not to overwork the mix as you don’t want to develop the gluten bonds. ******You may not need all the milk so as soon as you can bring the mix together you don’t need to add any more. Place it in the fridge for half an hour or so if your margarine has lost some of it’s firmness. It’s important while you’re working with the pastry dough to keep it dusted with flour so it doesn’t stick. It’s a delicate pastry and will rip if it sticks and you don’t want that. 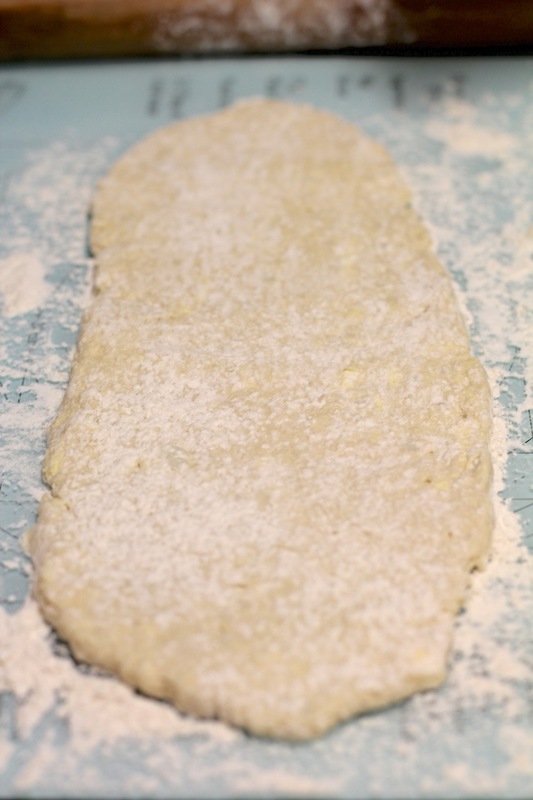 -Place the dough onto a floured surface and form it roughly into a rectangle. Dust the top with a little flour and begin to roll it out with your rolling pin. It’s much better to roll it out bit by bit and not try to get it too thin in one go. You’re aiming for a lovely uniform piece of dough every time. Roll it away from yourself to a thickness of about 1 cm. It should be a long rectangle (about three times longer than it is wide). Now fold the third that’s closer to you over into the middle. Fold the third that’s furthest away from you over that. Now it should be roughly square and three layers thick. Turn it 90°, and roll it out again. Once you have the long rectangle again, fold the bottom and top thirds into the middle as before. Try to be really pedantic about getting this right. Keep it uniform in thickness and shape as much as possible. Repeat this roll and fold process four times in total. What this does is sandwiches the rough chunks of fat in between 12 layers of pastry. This is where it gets it’s lovely, flaky, layered texture. This is where all the magic is! 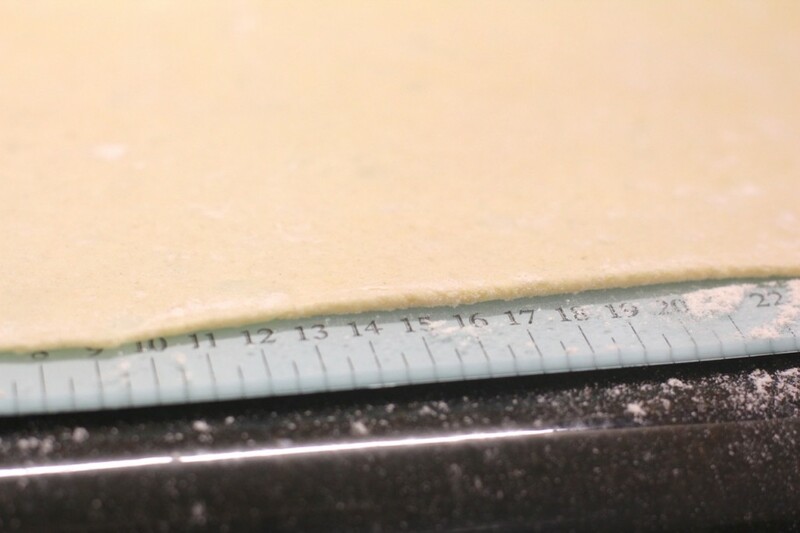 -Once you’ve done your final fold, roll the dough out to a length of about 35-40cm. Then roll it width-ways until it’s about 3mm thick. Make sure it is the right size to fit your pie tin. I used a flan tin, so it was a decent size, and i had enough pastry left over to do 3 little individual pies. 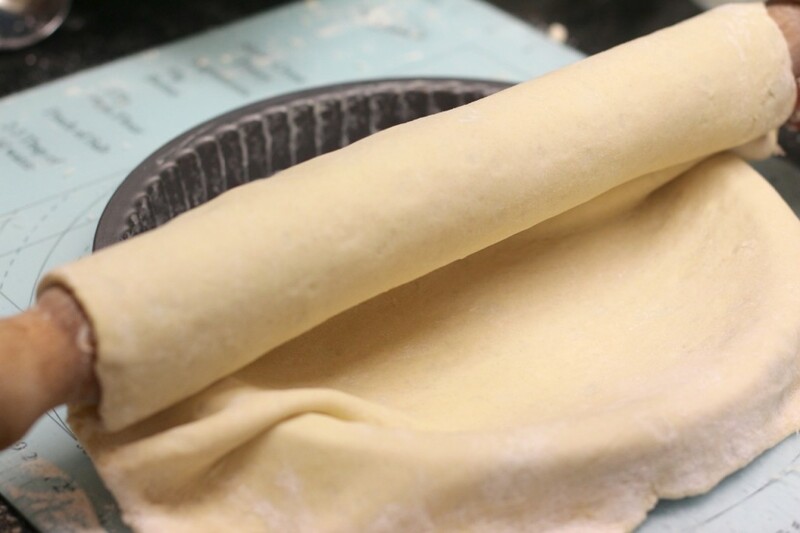 Take your rolling pin and use it to roll the pastry onto, for an easy transfer to the pie tin without stretching or breaking it. 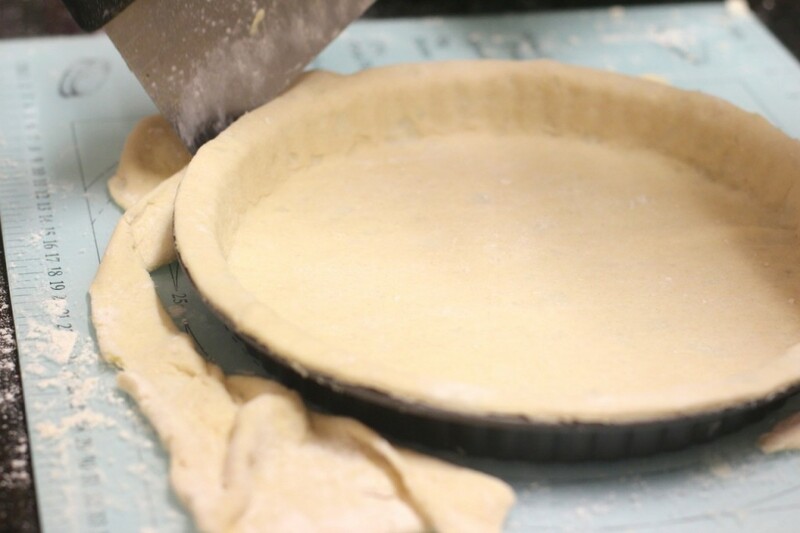 Sit the rolling pin over you pie tin and unroll the pastry without stretching it. it is better to get in in kind of gathered and straighten it out once its in. Shape the pastry to the tin and cut off the excess taking care to remember it will shrink slightly so don’t cut it too close. Place parchment paper inside the pie crust and fill with baking beads, making sure they go right to the edge as you want it all to stay flattened without rising. Bake at approx 180c, depending on your oven, and keep an eye to make sure your edges don’t over brown, taking care to cover the edges with foil if needs be. -When baked, remove to cool. Combine all the ingredients and whisk together in a saucepan and bring it up to heat. Cook down, allowing time for the corn starch to thicken, taking care not to burn the bottom. This took at least 15 mins for me.Once done, pour into pie shell and refridgerate to set. It needs to set OVERNIGHT, or it will not be firm! It is still somewhat liquidy when you pour it in. Put both ingredients into the mixer and start beating. I do this before I do the sugar syrup and leave it running the whole time. Yes, I hear you, 1.5 cups IS ALOT of Aqua Faba, but the whole point of a dessert is indulgence, not stingyness, so we want a nice big pile of Meringue! Add 2 tsp vanilla extract once it has whipped to stiff peaks. Place sugar syrup ingredients in a saucepan and bring to the boil. You may find a candy thermometre useful to make this (and alot of other recipes I have ) , otherwise use the cold water test described in the instructions above. You can get a cheap candy thermometer here in the UK/ Europe: Kitchen Craft Cooking Thermometer (£2.20) and here in the USA ($5.99) : Farberware Protek Candy and Deep Fry Glass Thermometer, Clear Boil until it reaches 250f! Give it a stir once in a while so you don’t burn it. When it reaches 250f, take it off the heat and slowly add it to the running mixer. I used my splash guard on the mixer as it was at totally full capacity with that amount of AF foam! Gradually pour all the sugar syrup in and continue to beat. You will get steam coming off it as it is still hot so leave it running and it cools down somewhat. 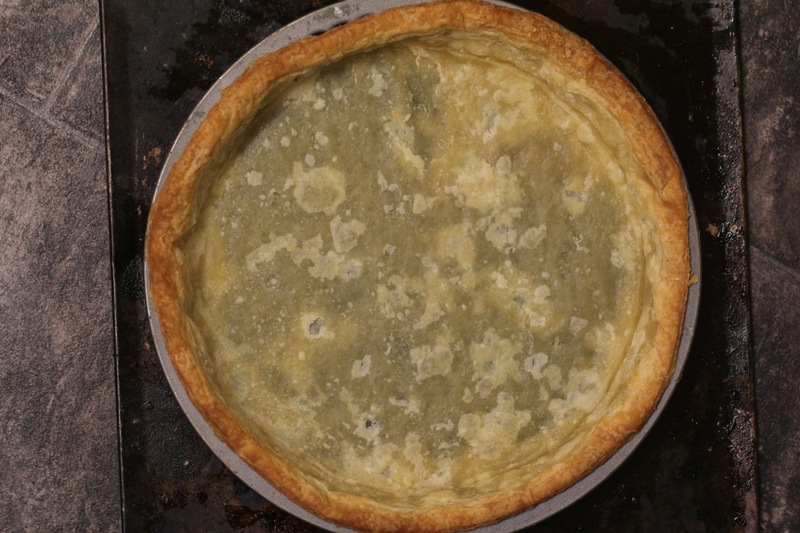 Once it is thick and glossy and not piping hot you can add it to the pie. Get a 50cm piping bag and tip ready. 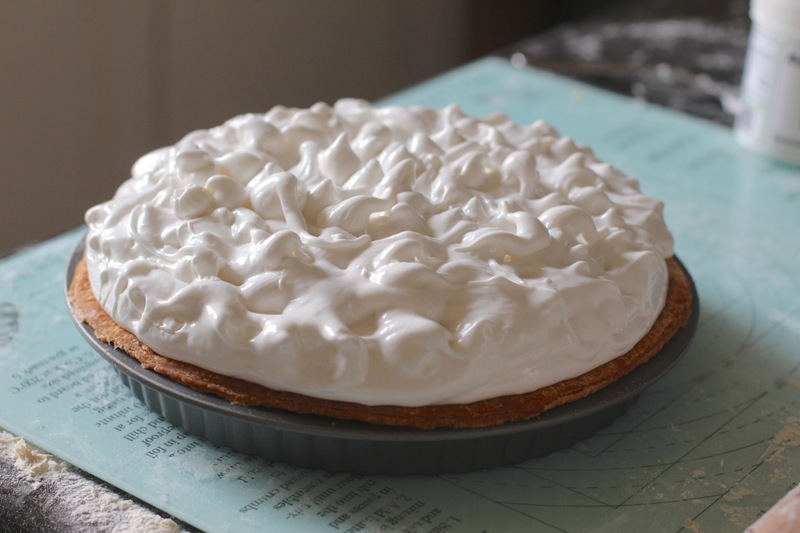 I added most of the meringue in a pile on the pie, and THEN piped a top layer on top and used the tip to make peaks. Leave it to cool for a while and the top will set. Then you can either torch the top, or put it under the broiler. 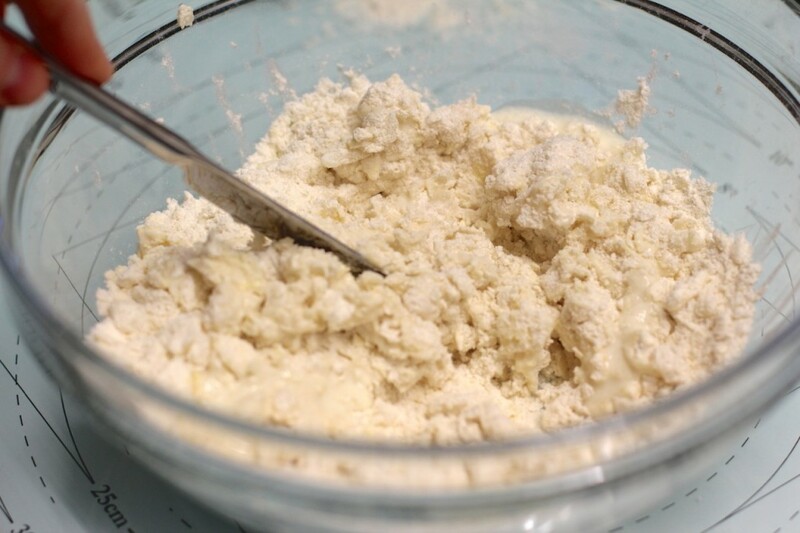 -Put the self raising flour in a mixing bowl. If you don’t have self raising flour, just add 1.5 tsp (8g) to 150g of plain flour of baking powder. Mix it into the other dry ingredients and add the margarines. 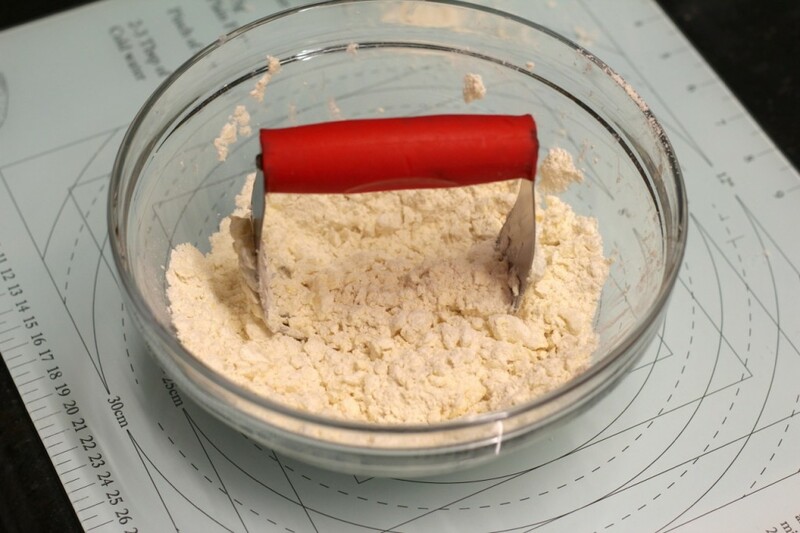 Place the dough onto a floured surface and form it roughly into a rectangle. 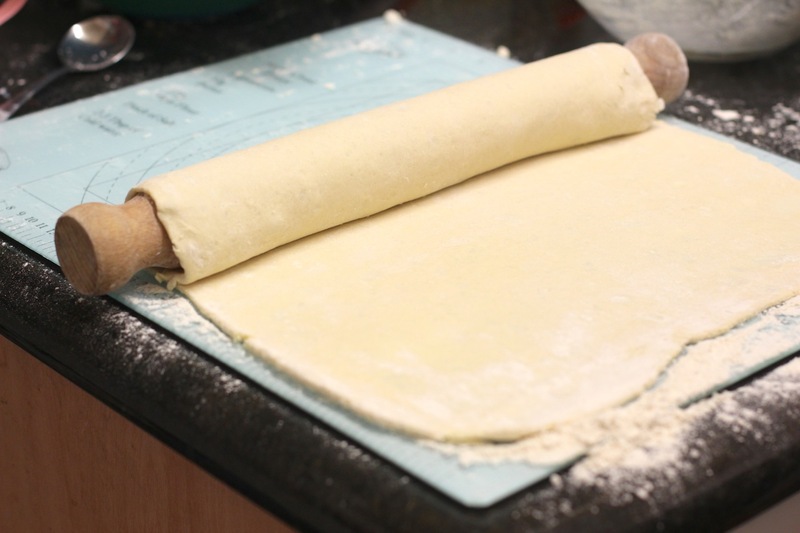 Dust the top with a little flour and begin to roll it out with your rolling pin. It’s much better to roll it out bit by bit and not try to get it too thin in one go. You’re aiming for a lovely uniform piece of dough every time. Roll it away from yourself to a thickness of about 1 cm. It should be a long rectangle (about three times longer than it is wide). Once you’ve done your final fold, roll the dough out to a length of about 35-40cm. Then roll it width-ways until it’s about 3mm thick. When baked, remove to cool. Cook down, allowing time for the maize starch to thicken, taking care not to burn the bottom. This took at least 15 mins for me. Once done, pour into pie shell and refrigerate to set. It needs to set OVERNIGHT, or it will not be firm! -Put both ingredients into the mixer and start beating. 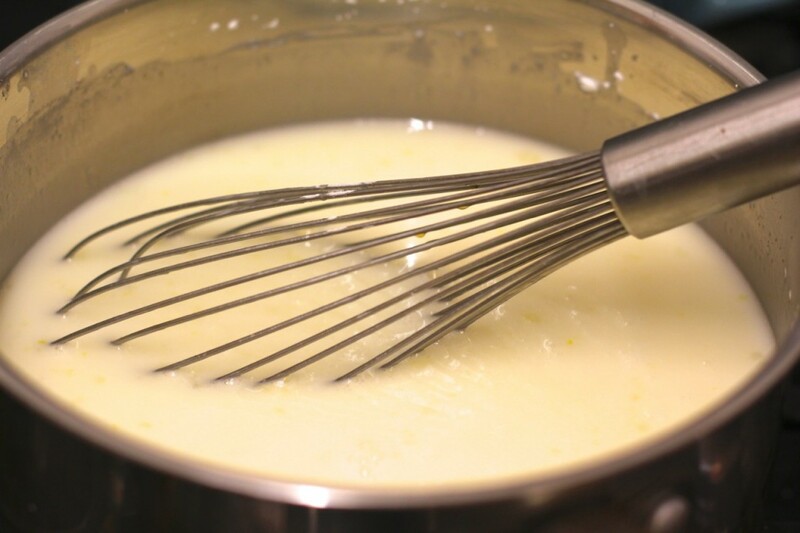 – Add 2 tsp vanilla extract once it has whipped to stiff peaks. -Place sugar syrup ingredients in a saucepan and bring to the boil. You can get a cheap candy thermometer here in the UK/ Europe: Kitchen Craft Cooking Thermometer (£2.20)and here in the USA ($5.99):Farberware Protek Candy and Deep Fry Glass Thermometer, Clear Boil until it reaches 250f! -Give it a stir once in a while so you don’t burn it. -When it reaches 250f, take it off the heat and slowly add it to the running mixer. -Gradually pour all the sugar syrup in and continue to beat. -Once it is thick and glossy and not piping hot you can add it to the pie. -Get a 50cm piping bag and tip ready. 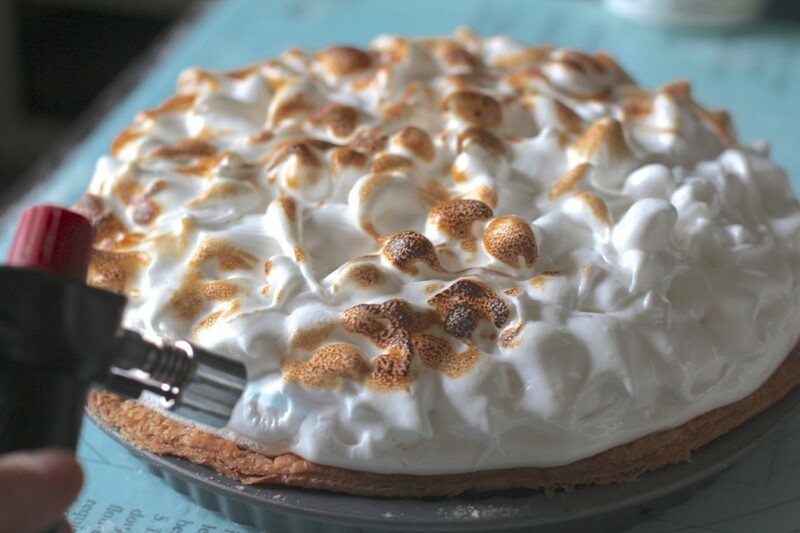 -I added most of the meringue in a pile on the pie, and THEN piped a top layer on top and used the tip to make peaks. This looks amazing. Will glucose crystals work instead of glucose syrup? You can only try it! A few people on the Plantified Facebook group have already made it and said they had no problems with the syrup crystalising for them without glucose syrup, so you could just give it a go without if you'd like. I used to use Glucose powder to make icecream! It gives it a great, scoopable texture, without being too sweet! That's a good suggestion for those choosing not to use glucose syrup (not agitating the syrup whilst it boils). That is what I do when I make a caramelised syrup. I still think there is a benefit in using the glucose syrup for the mouthfeel etc, if you can get some. Wiltons sell glucose syrup in the USA. I'm going to try agave instead of making the sugar syrup. Looks wonderful! I haven't made it with either syrup, but I *think* you might be able to with Agave possibly. I think Maple will crystallise. I would suggest testing it,- at the worst you will end up with a bowl of yummy stuff to turn into an icecream or something, if it flops. I have used agave to make Nougat, so I think it might work with adjustments of the ingredients. If I was to try it, I would try the same weight in agave as sugar, add the agar, and a little glucose if you can. Bring it up to 250c and add it slowly to the mixer to gauge how much you will need to add...Maybe the whole lot, maybe not...When I get a chance I will have a try, but no time at the moment! 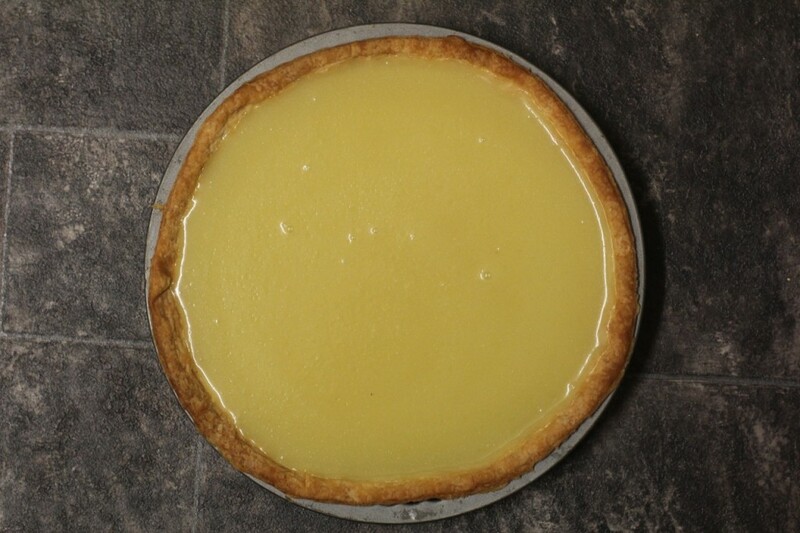 I am also going to do a coconut free lemon curd, and make it with Plantified Double cream instead (recipe coming soon) and also a gluten free crust option, so people can mix and match the base, filling and topping to suit. Let me know how you go! Could you do a printer friendly recipe which pops up in a different window? I clicked 'print recipe', and got 21 pages with pictures! This looks amazing, I'm so excited to try it! I have a couple of questions which it would be great if you could help me with. If I don't have baking beads, is there anything else I could use? Just glass marbles or something? In the ingredients for the lemon curd, is that 1000 ml of coconut cream? i.e., a litre? Or is it 100ml? Just want to make sure! Hi Julia! Yes, you could use Rice or Dried Beans to weight down the pastry during baking. Place some parchment paper in first so they don't get stuck on the pastry! :) Then keep the rice or beans aside to use next time, as it will no longer be good for cooking! Yes, it is 1000ml of coconut milk! :) I often cheat and use 800 ml plus 200 mls of soy milk so I only have to open two cans. I also have a recipe for a delicious Lemon curd (similar rich taste) Using Plantified Soy Double Cream instead of coconut cream, for those who can't get coconut cream, as some have told me it is expensive where they live. I will put that up on the site too so you can pick and mix the elements you want to make the pie! I am making the meringue right now for the prepared pie and it won't become super thick! I sadly thought I had agar but it was pectin. I used that. Any thoughts on what to do?! Sorry, I just saw this message Rachna! I have been out today... Hmmm, it needs the agar to set it. I guess by now you just popped it on top and hoped for the best? Let me know what happened, and make sure you get some Agar, so you can try it again! If I didn't have agar, I would try some carrageenan as that has similar setting properties, but then I have a lot of choices in the cupboard at any one time.. I'm a friend of Sheila Rosa Meyer. I am a year old vegan but a long time vegetarian in the past. I'd like to be a member of your group, please. I have to tell you, Katrina, that this went down a treat at our early Chrimbo dinner last weekend! 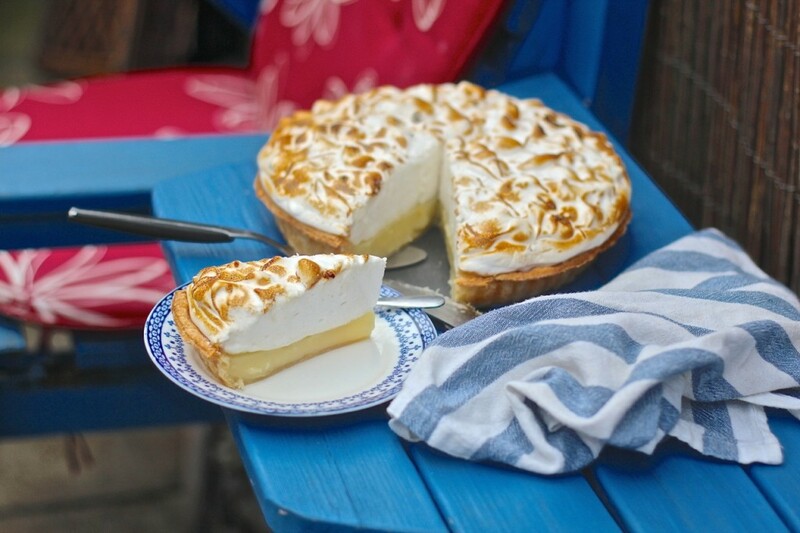 I used my own sweet shortcrust pastry and lemon curd recipes but the meringue was all yours. It makes all the difference, using syrup, and not baking. I normally use dry caster sugar, and then bake for several hours - this is so much easier and quicker. And I got to use my MIL's Kenwood, which was a joy to use! Don't know if I mentioned it to you before but as a child, my son (now 31, and a father himself! 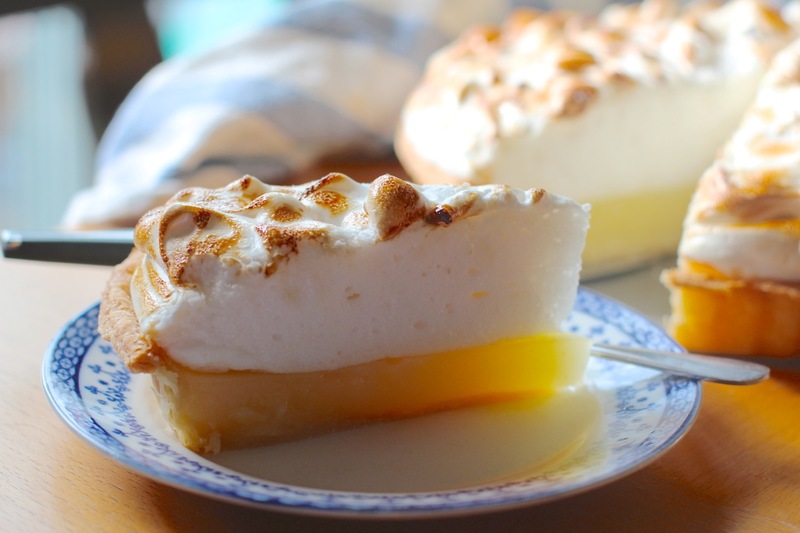 ), whenever it was his birthday, would ask me to make him a lemon meringue pie instead of a cake, which is why I wanted to make this for our Christmas dessert. Coincidentally, on Sunday, before he knew that I'd made the pie, he was telling me that he was having a discussion with some of his friends about LMP, and one of them said he needed to learn how to make it; Josh apparently said, "I don't need to learn because my mum makes the best lemon meringue pie in the world, and mine could never be as good hers. I wish I'd asked her to make one when she comes over to see us." He was a bit gobsmacked when I then brought out THE pie! Even more so when he realised that it was completely vegan, And was mightily impressed too! As was Vicky (his partner). Raven (my granddaughter) seemed to love the meringue - we didn't try her with the pastry or curd. In fact, Vicky was so impressed that she took the rest of the pie home! So there you are - your vegan meringue, loved by omnis who had no idea it was vegan until I told them! Ok, well a few things to consider- -What vanilla extract did you use? The same as the first time, or a different type? Any addititve containing oil will cause problems. -Was your equiptment clean and free from oil? 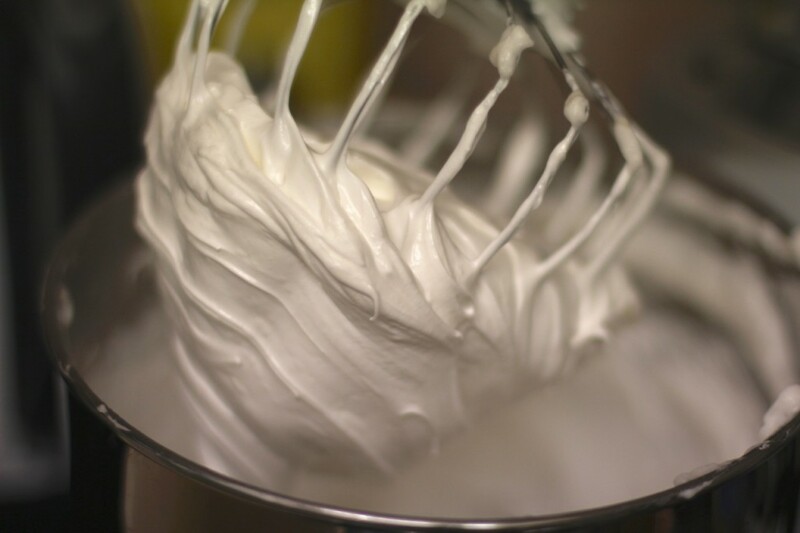 -I always use canned Aquafaba so can't comment on the performance of homemade Aquafaba. If I have a brand that doesn't work well, I avoid that brand. -What altitude are you at? Some people have reported, who live in high or humid places that their Aquafaba fails sometimes. I don't have any problems with the in North Wales! :) -Importantly, is your THERMOMETRE accurate and performing properly, and your syrup definately hit 250f? 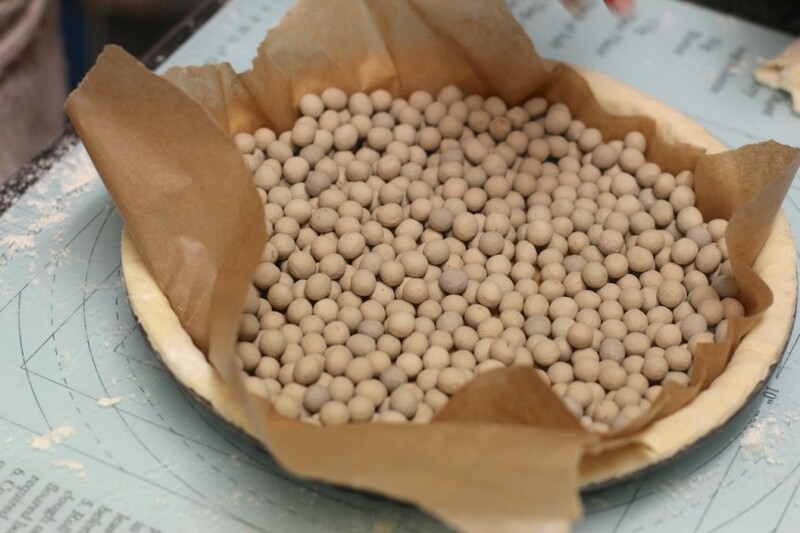 If it is not reaching the proper temperature, then the water content will be too high and the aquafaba will not be able to hold it. -Did you start the fluff beating and keep it beating long before making the syrup? As i mention, i do this because unbelievably it inflates even further, the longer it is whipped. I have had this happen twice when making marshmallow, embarrassingly in front of guests, and just couldn;t work out what was going on. I repeated the batch and it flopped again! I finally narrowed it down to using a different colourant (yellow) as i ran out of the original colour i had been using which was an artificial yellow that worked fine. The next two times, i tried natural yellow, two different brands and it collapsed ,but have since worked out that it is because they contain Curcumin and it collapses Aquafaba. So basically, either you are making a volume error when trying to scale the recipe, which results in a flop, or it is a technique problem (ie not whipping the AF enough), a technical problem (such as faulty thermometre), an additive (such as an oil containing vanilla flavouring or not clean appliances) or something like humidity etc. I will do a you tube video on this recipe soon, and also transpose the whole recipe to grams, as that is much more accurate than cups and spoons etc! I did make your pie and in the end it was quite tasty but I changed the amount of cornstarch. I just couldn't make myself add over 3/4 cup (100 grams) so I used 3 Tablespoons and still had to thin it down with some leftover lemon juice and water. The meringue set up enough to make soft peaks with the sugar syrup but I think I get fluffier meringue just using sugar. So is the 100 grams of cornstarch in the recipe correct? Thanks for your inspiration. No one can believe the meringue is made out of bean juice. Yes, 100 grams is correct. You are adding it to 1.375 litres of liquid! It will be runny when cooked, and will set in the pastry case overnight. The texture when set, holds its shape but is not rubbery. The Meringue mimics a cooked egg meringue in texture much more closely than if you just use ordinary meringue on top, as that doesn't set and stays soft. If you want bigger peaks, put the bulk of the meringue on, and then put the rest onto a piping bag, twist it and wait for it to cool down more, then it will hold its peaks! By the way, the meringue if made and measured correctly, will be as light as a feather on your spoon when set. If the agar has been measured without a gram scale, and there is too much added,it will be denser and you will be heading more towards a texture of marshmallow, which is not what you want, so if you don't have a gram scale, get one from ebay or amazon! You can pick yourself up one for about $7 and you will absolutely need it to make the Mousse recipes and Eggless Omelettes etc when they come out as the weight needs to be precision! Thanks you so much for your detailed reply. I am getting confused between milliliters, cups and liters. I finally figured out what I did and just had a mental block. I made 1/3 of the recipe and then thought 1/4 cup cornstarch was too much but I think I just like the lemon filling to be a little softer. I will definitely retry your meringue. I do have a scale with grams but it didn't seem to register when I started adding the agar to the sugar in the bowl (after resetting the scale to 0) so I changed my method and used teaspoons trying to estimate what I had already added to the sugar in the bowl and undoubtedly added too much. My daughter who has gone vegan on me loved the mini pie I made for her :). Thanks again. I'm thinking of combing the Meringue with the lemon filling to make a Mousse, Do you think that would work? How long should the pastry cook in the oven? I always goes by sight as it depends on the type of oven etc. The sides will brown somewhat, at which point I take it out and protect the top side edges with foil so they don't darken too much and then pop it back in. If you are not sure if its done, then lift the shell slightly out of its flan tin (it should slide out easily when cooked) and look to see if the shell has a nice colour too it like in the pics- if so, then it is done! I used baking beads in mine that help keep it flat and transfer heat to the inside shell too. Hi. I am making this meringue and using cups/ tbsp./ tsp for all your measures would be very helpful. I am writing from Canada and measuring ingredients in grams is unusual here. I have made pie crust, filling before but am looking for meringue that doesn't collapse. Your recipe looks very promising, thank you. Icing sugar is the same as castor sugar? Hi Karin! There is a specific reason I measure in Grams only- becuase it is MUCH more accurate! I grew up using both cups and spoons in australia AND grams because we are both influenced by the USA and the UK in our culture, so you will notice some of my earlier recipes have either or both measurements. However, I want everyone to be able to replicate things exactly as intended and you just cannot do that with cups and spoons! Everyones cup of flour is going to weigh differently which will affect the finished result, and you cannot possibly measure things like Hydrocolloids accurately with a spoon! 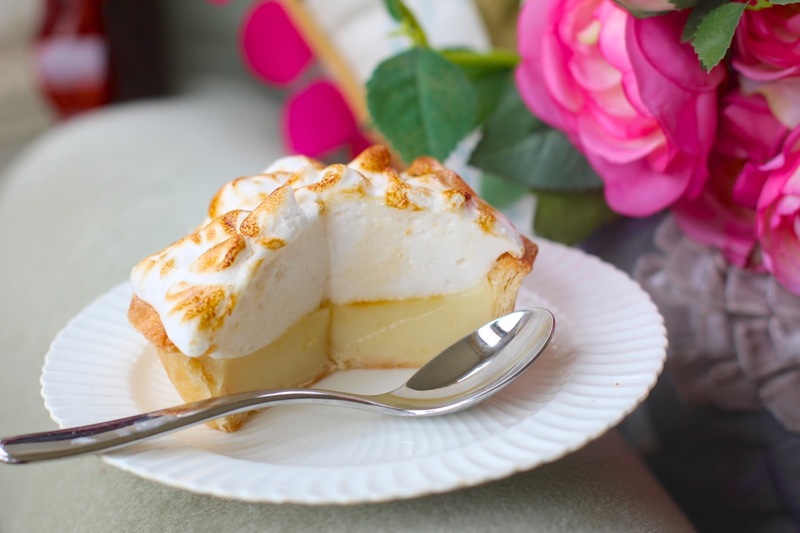 If you put too much, or too little Agar in the meringue for example, it will either fail, or be like marshmallow instead of a delicate egg like meringue! I made the mistake doing the Mousse E-book of writing it all up in cups and spoons, and failed reproducing some of them- they just were NOT right, even though i had written the recipes, which is when i realised if I wanted everyone to have success, i would have to go back painstakingly again with a scale and try to accurately record the exact weight in grams of everything. There is a massive difference in texture when the measurement is out. Also, I went and got all of my different cup measurement, filled and weighed them and they were all different by quite an amount (even in ml) even though they were all bought in this country! &&*&^$^££$@!!!! i am striving for perfection here- to produce foods that are fabulous, and delicate in texture- just right in taste, and it means precise measurement! However, everyone around the world can cheaply access a digital scale, whereas cups and spoon measurements are different depending in which country you are in, it is a nightmare! So grams it is from now on! Please trust me on this :) and give it a go! it also means alot less washing up! You can weigh into one bowl and reset the scale n between instead of dirtying many implements! Bonus! I use two scales, one cost £8 for a Salter brand scale and measures from a few grams up to 5 kg, and the other is a little scales, that measures fractions of a gram upwards...I bought mine off ebay/amazon and it cost £3 ish with free postage! (google gram scale) Oooh, the other benefit is it is super easy to scale a recipe up or down when its in grams also! Icing sugar in the UK, is what you call confectioners sugar- you use it to make frosting (or icing as we call it!) Caster Sugar is called Super fine granulated or something like that in the USA and is used to make cakes etc, as it is better than the ordinary granulated. Ah! Based on your reply, Karin (or anyone from the future reading and wondering the same) on Canada that sugar is called "berry sugar", also made by Red Path If you generally use normal white sugar. It will be right beside the regular white sugar, made by Red Path. 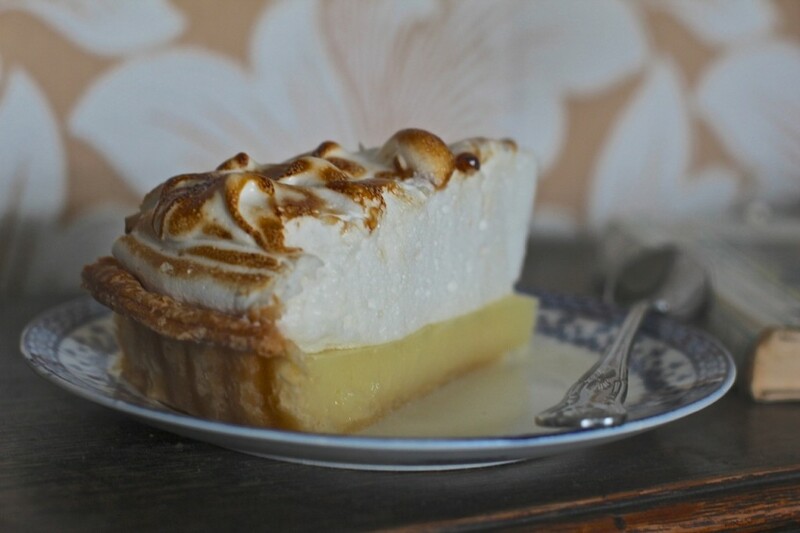 When I was little, my mother and I used to go to a bakery as a special treat, and I usually chose a slice of the lemon meringue pie. I made this recipe last night, and it tastes exactly how I remember that pie tasting. Since going vegan, I thought I'd never get to taste it again, so thank you! Hello, I do have a question to make, Do I mix the piping hot sugar sirup with the foam aquafaba? 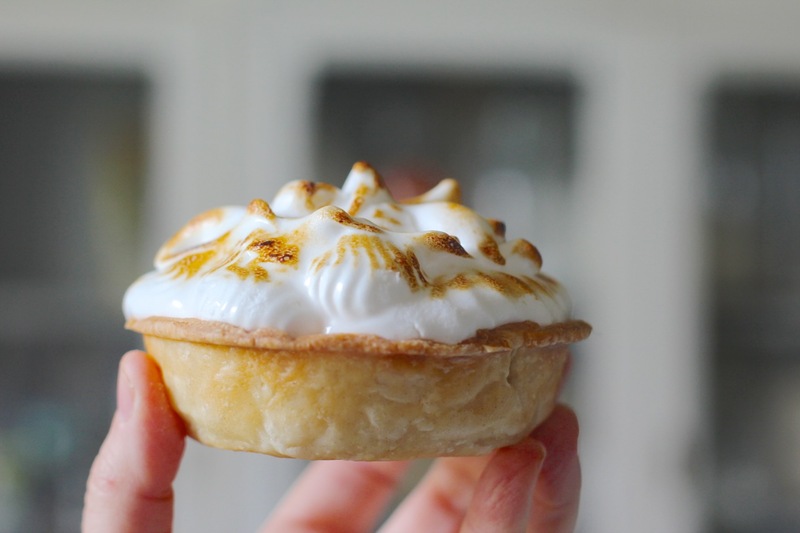 Isn't the aquafaba going to flatten back? Thank you! Hi Poppy! Yes, you do. You need to have the mixer running on the Aquafaba, whipping it long before you start anything else, as it inlates in volumes so much more over time with whipping, then when the sugar syrup is to temp, pour it in in a THIN stream while the mixer is running.Essentially, the sugar syrup will set as hard toffee if let to cool in the saucepan, so as it is added in a thin stream and incorporated into the Aquafaba, it firms up the Aquafaba along with the setting gel action of the Agar Agar in the syrup as it cools down also. Then once its all add, I leave the mixer to continue running while it whips as the mixture cools down and stabilises further and take it off when warm, not hot still. If you want to pipe it, them add it to a very large, 50cm piping back and twist the top sealed and set in a alrge vase a a stand while not using. It will cool slower in a piping back, but you can get the temp down closer to setting so it is pipeable and holds shape this way. If you don't want to pipe, then add a layer of the meringue to the pie (and the rest to a piping bag to stop it setting too quick ) and leave for a moment while it sets on the pie as a good fat meringue base, and then once set, add the rest, pouring it on and then peaking it up with a spoon or the like. 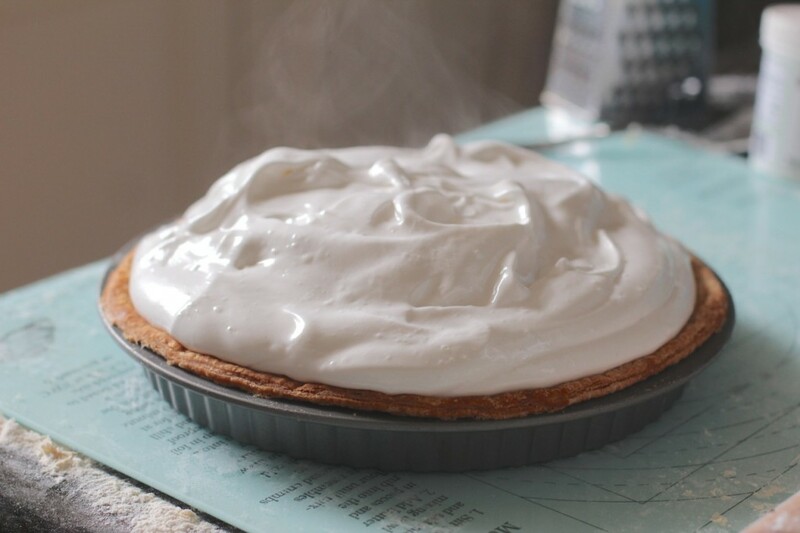 If you try to add it all at once, because of the sheer volume and weight of the meringue, it will spread and start trying to slop off the side of the pie before it can set and hold it's shape, so to build a nice high layer, best to do in the way I described above! Hi there! If you read the directions, this is exactly as I have done. As the Meringue is already "cooked" through a heated syrup and sets with the Agar, there is no need for it to be baked in an oven, and I used a blow torch on it also. If you do put the meringue in an oven, because of the Agar, the top will get slightly "chewy" anyway, so it is preferable to not oven bake it! 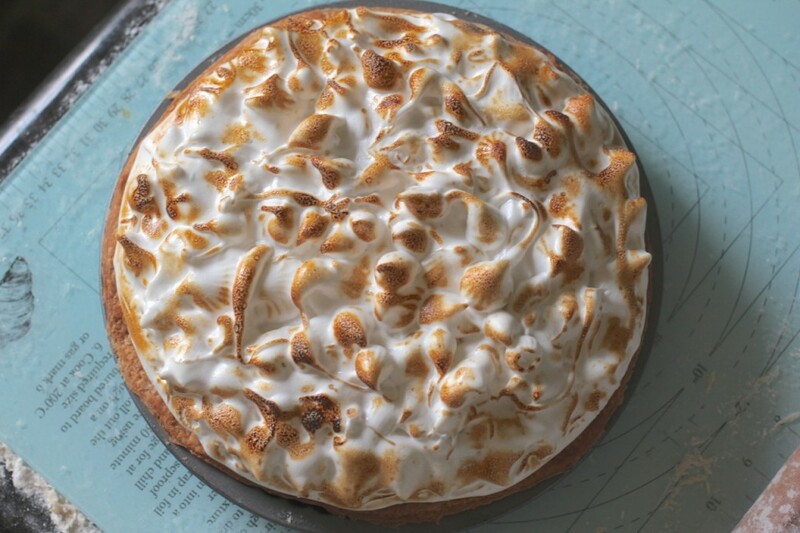 If however one doe want a crusty top, then making the meringue as directed in the recipe and allowing to set, then topping with an additional thin layer of plain meringue with no agar, to cook as a crust will do the trick! Enjoy! I have made this twice. First time I used a basic aquafaba meringue recipe and it was great, very light and airy even if it did deflate a bit. This time I used this recipe for the meringue and it didn't go down well at all. It was very hard and gelatinous, not like a light and fluffy meringue at all.. It was more like a marshmallow. I wouldn't make this meringue again. Does the filling taste at all like coconut? No, it doesn't funnily enough!!! It is very lemony, so that is the over riding flavour. You could use soy cream if you like, or for a less rich curd, a plant milk, as long as you use the right quantity of corn starch (corn flour) to set it. I often use 2 cans (800 ml) coconut and make up the rest of the quantity with soy milk to avoid using another part can of coconut. I also use some coconut cream/milk in the Creamy vegetable pot pies, but no one has ever picked that when eating them! Thank you for the awesome recipe, I will try it this weekend (that will be one way to get people convinced that vegans don;t only eat grass!). Thank you for the awesome recipe, I will try it this weekend (that will be one way to get people convinced that vegans don't only eat grass!). Hi! I'm making this amazing pie right now - thank you for the recipe <3 Question - how long does it last? I'm making it for my partner's birthday on Saturday, and have already baked the shell and the curd (and put the two together in the fridge!) I'm wondering if I can make the meringue the day before? Or should I make the meringue the day of? Hi Nicole. Shelf life of a completed pie would be until it spoiled, so probably two weeks. The Meringue won't deflate, it will stay as it- the only difference is the top layer may slide of the curd a bit when its older as the sugar dissolves between the two layers a little. The one in the pics was made to take to a friends house, and was in the fridge for two days before it was sliced and eaten. Others I have made to take elsewhere, such as a road trip to London, (5 hours from here) and it was perfectly fine when eaten the next day. It behaves just like a cooked egg meringue. Make sure you weigh the Agar precisely, as too much will lose the delicateness of the meringue and make it more marshmallow like. There's just enough to stabilise it, while keeping it delicate and light as a cloud! You can also freeze the finished result and defrost for home eating, however to take to an event, baked fresh is always nicest! Hi Aletia I'm not sure whether you cannot eat Xanthan, or you have reservations about it, but Xanthan Gum is not a must, but it is a thickner and it stabilises the Aquafaba, and it also has a synergistic relationship with the Agar agar. It also reduces weeping of the sugar solution over time. However, it will still work, with a substitute, and be good enough. Guar gum is also a thickner, as is Locust bean gum (carob bean) ,so one of those would be my next choice, otherwise a pinch of cream of Tartar, or a squeeze of lemon juice, as some use to make meringues. You will have to adjust the amounts used, as if you use too much of any, it will make it too firm...too much locust bean gum for example will make it too elastic. I would choose Xanthan gum as a first option obviously, as it does the job. I used your meringue recipe, minus the glucose syrup, to top a lemon meringue pie and it turned out so well! 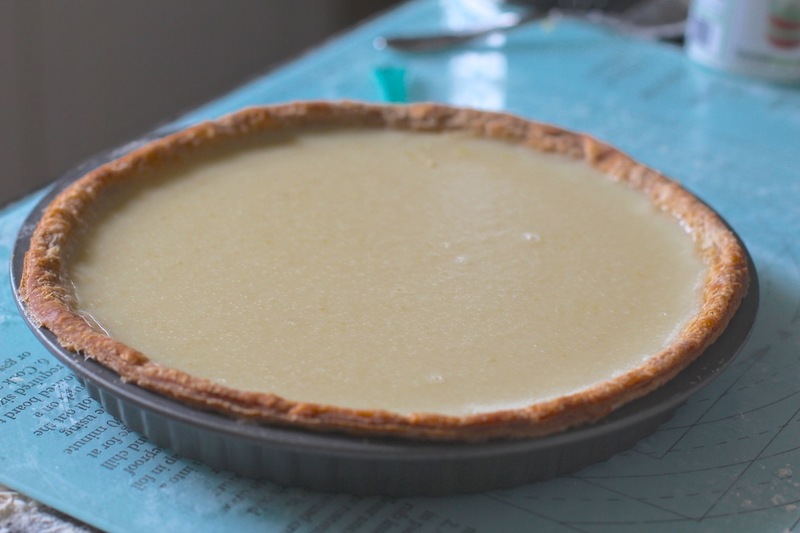 I used a different vegan lemon curd recipe (already had some in the fridge), and I used a graham cracker crust instead of the flaky pastry, but the meringue was the best part :) Next time I'll try making your lemon filling recipe, too. Anyway, the meringue topping was sooo goooooood! My friends were really really impressed. Thanks for posting!!! Hi Cate Can you please elaborate on what you mean by the filling wasn't smooth? It should be if made correctly. If you look at the pics of it poured into the shell it is smooth and lump free, and you can see the texture in the cut slice too. Was yours lumpy, or too solid possibly? If it was lumpy, then you need to stir it well to incorporate the cornflour before it is heated- if you add it when the liquid is warm, you will get lumps of cornflour. if you accidentally do that, you can save it by blending with a blending stick. If it was too solid (it should hold its shape, but not be rubbery) then reduce the cornflour down to get the right consistency for your ingredients. When it is cooked and poured in it will be very liquidy but will set overnight in the fridge. Hi Katrina, thanks for replying :) It wasn't lumpy, it was just a little bit too rigid once set. I will try your recommendation of reducing the cornflour for a softer result. Thankyou so much for the recipe though. Hi Katrina! first of all, I am 100% on your wavelength when it comes to measuring by weight and not volume. Weighing is the way to accurate results! I wish more chefs were like you. So I have a question about this recipe - is this true shortcrust pastry, or puff, or a hybrid? I've never seen a shortcrust pastry recipe or pie crust recipe that uses self-raising flour. In addition, I've never seen one that includes folding the pastry in the method (almost like croissant pastry). Thanks! Hi Claire It's not at all like puff pastry in texture...It's like a short crust, in that it almost evaporates in your mouth, but it's not like an English short crust- it's more like a french tart base. The Self raising makes it lighter, but if you can't get it where you are you can make it with plain flour and baking powder. Use 1 cup of plain flour and 1 raised teaspoon of baking powder in place of each cup of self raising in the recipe. Try the pastry- it's the best ever! It's sinfully evil, but terribly good! Hi Katrina! This looks amazing. I want to make this for a friend. 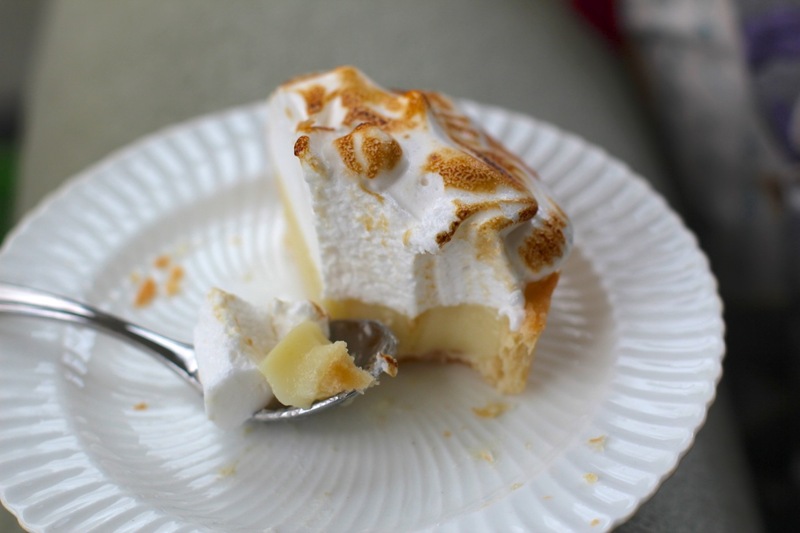 How long will the meringue hold up if refrigerated? I’m wondering if I can make it a day or two ahead of time. Thanks! Hi Dal! Thanks, it tastes terrific too! You can make it in advance and it will be fine! I have even taken one made in advance on a 5 hr road trip down to London, and it was in fine shape when we arrived! The meringue will stay inflated and intact until eaten. Because it is stabilised by the little bit of Agar agar, it will not melt back down like an ordinary Aquafaba meringue over time. Hi Neha You could use a condensed milk product- I make my own soy based condensed milk and the recipe is on the site here. If you did that ,you would have to adjust the sugar content of the filling down to taste, as condensed milk is already sweet. 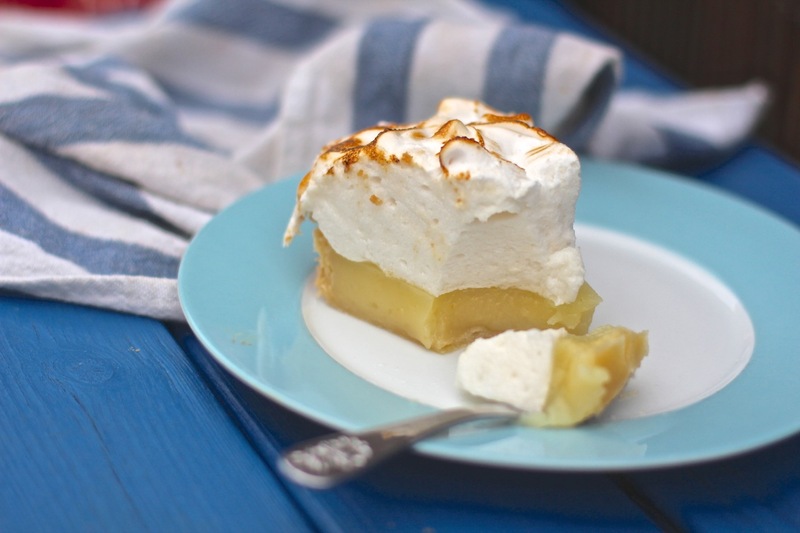 I remember awesome lemon meringue pie filling with condensed milk form childhood! Very rich but delicious. Alternatively, just use a plant based milk, like soy milk to make the custard, and it will still be nice, but not as rich! Thanks Shauna! I'm glad you enjoyed it! Yes patience is a virtue, specially in this case! It needs to keep beating as it cools in order to build up the structure to support itself, or it won't be able to hold its own weight. I tend to put a bit of a layer on the pie, then put the rest into a 50 cm piping bag, and then twist the bag tightly to slow it cooling (as you don't want it to set in the bag. Once the first layer has set, I'll then build up the height with another layer, and I continue this way until I have built it up to the height I would like. This way I can get great height into the meringue topping without it spreading and flattening under its own weight,as the meringue slowly cools further in thee bag and nears it's setting point. Hi Laura Thanks for letting me know- it seems some text has misplaced the subscribed button, but the 2nd subscribe box below is fine. i'll get that fixed. I can add you to the list if you would like? Hi Tammy It will be fine out on the counter in normal room temps. I transported a pie down to London on a hot summers day in the car and it was out of the fridge for ten hours and totally fine. The meringue will stay intact and just as high.